Pruning the raspberries was one of the items on my “putting the garden to bed” to-do list. Pruning removes dead canes, opens the rest of the canes up to light and air and gives new canes room to grow. The best time to prune is in the fall. The canes have finished fruiting. Leaves have died and fallen off. New growth won’t start until the spring. The first step is to identify which canes are dead. You want to look for the canes that are woody. For our berries, that means I can see actual bark and it looks like the outer shell of the cane is peeling a bit. The cane in the centre of the picture below needs to go. The two on either side can stay to bear berries next year. Using sturdy clippers, cut the dead cane a couple of inches above the ground. 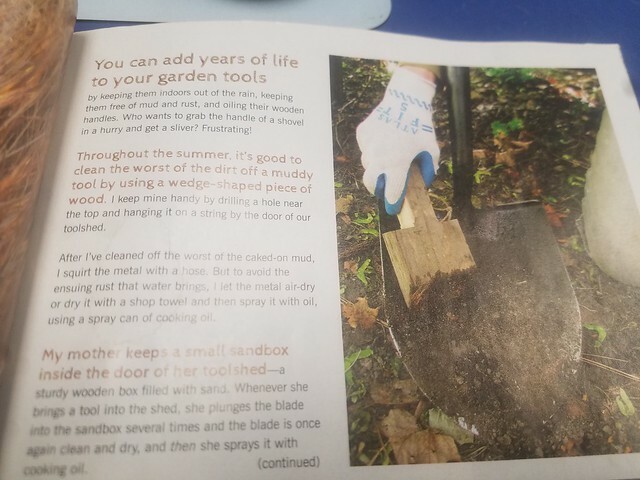 Pull the cut cane out of the row and throw it on your compost pile. 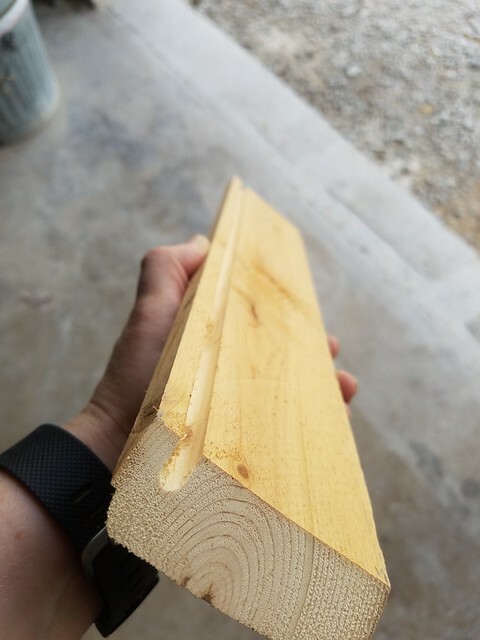 If your canes are very thick or tangled, you may need to clip the dead cane in half so that you can extract it from the row. It’s okay to have a little stump left behind. In a year or two, this stump will rot away. While you’re in your raspberry patch, now is also the time to weed (the last time this season). I also tuck the canes back under the wires of our trellis (here’s how we built our raspberry trellis). This contains the plants, helps them grow upright rather than flopping over and makes it easier for picking and care next year. You can see in the picture below one guy is on the wrong side of the wire (while his neighbour has bent over nearly backwards to grow within the row). At this time of year–especially while temperatures are still warm–the canes are pretty flexible, so it’s easy to bend and coax them under the wires. The result is a tidy row of plants with plenty of space to walk between the rows. Has anyone else been pruning raspberries? Any tips to share? How are you doing on your garden clean up this fall? Fresh country air is one of the best parts of summer living on the farm. But summer on the farm also means bugs, so screens are an absolute necessity. 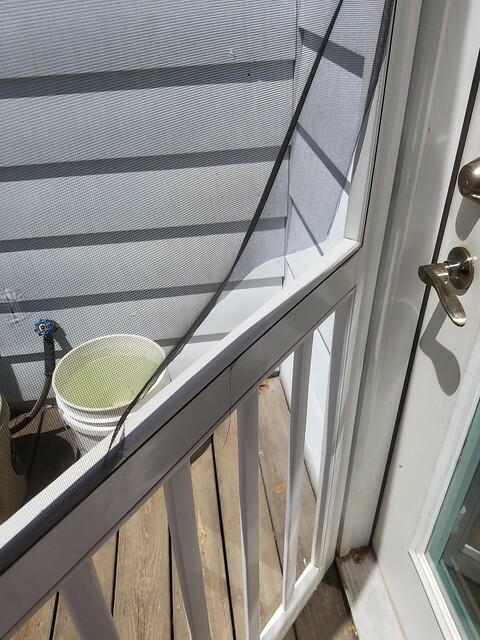 Sarah in Illinois is here today to share how she fixed her screen door after it had a few too many encounters with a puppy who was enthusiastic to enjoy the country air in person dog. I don’t think you can live in the country without a screen door. Unfortunately screen doors and young energetic dogs don’t mix. 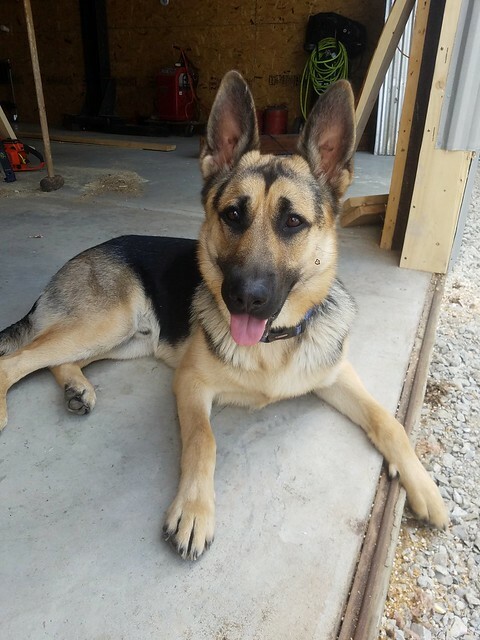 Blitz gets so excited to head outside that he pushes the door open with his big paws. 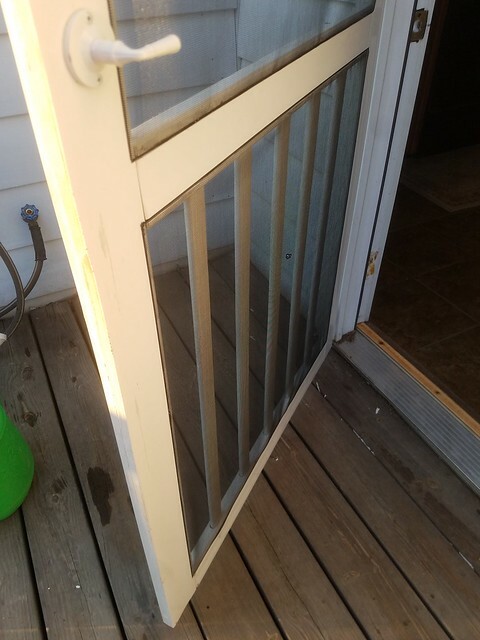 The screen became damaged enough that I decided that it was time to try my hand at re-screening a door. 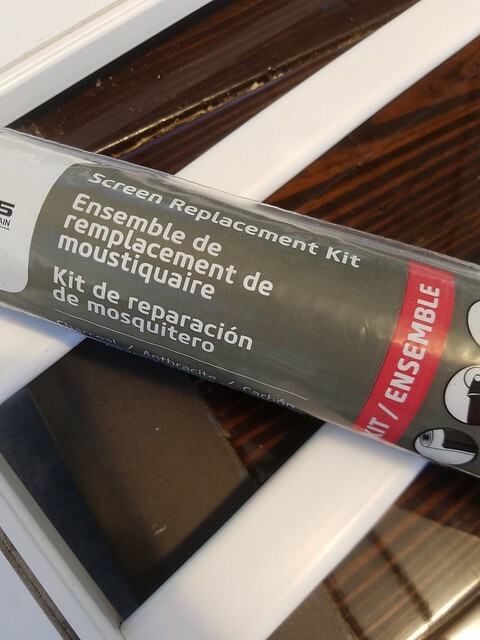 I started with buying a screen replacement kit at our closest home improvement store. 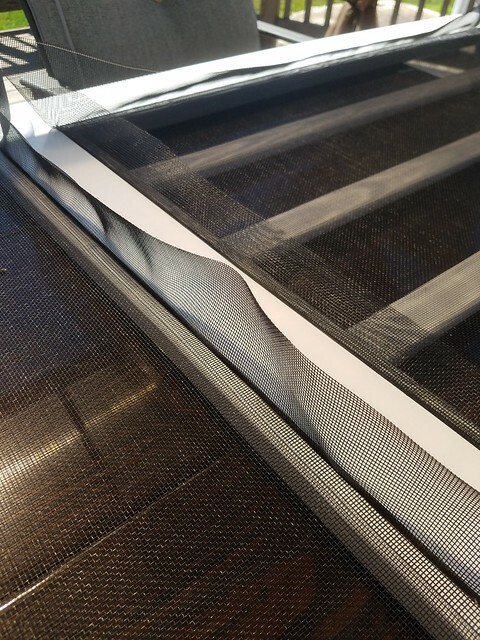 It comes with a large roll of screen, a roll of spline and a spline tool. 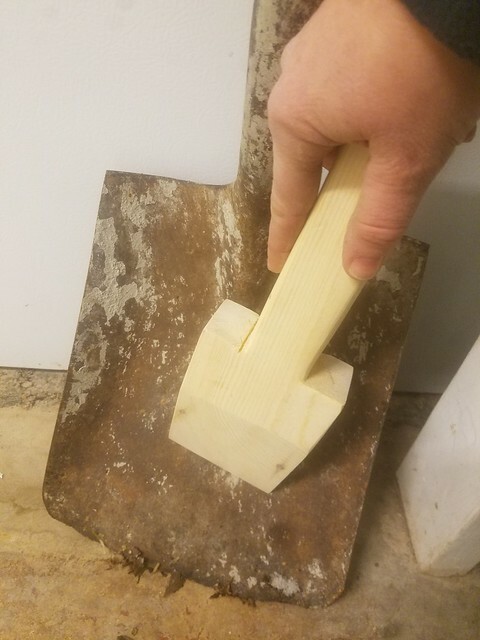 The only other tools that I needed were a utility knife and pick. 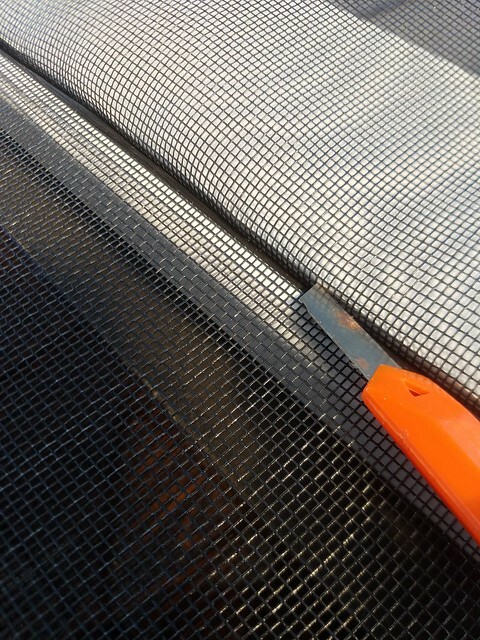 I started by removing the damaged screen and using the pick I pried all of the old spline out of the grooves. 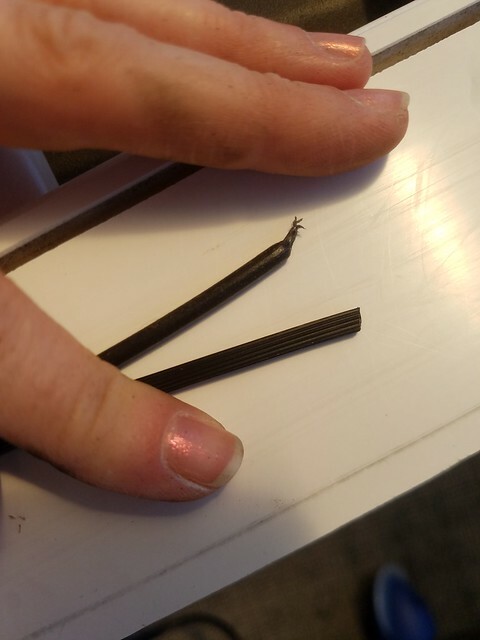 I compared my old spline to the new spline. My only concern was making sure that they were the same diameter. 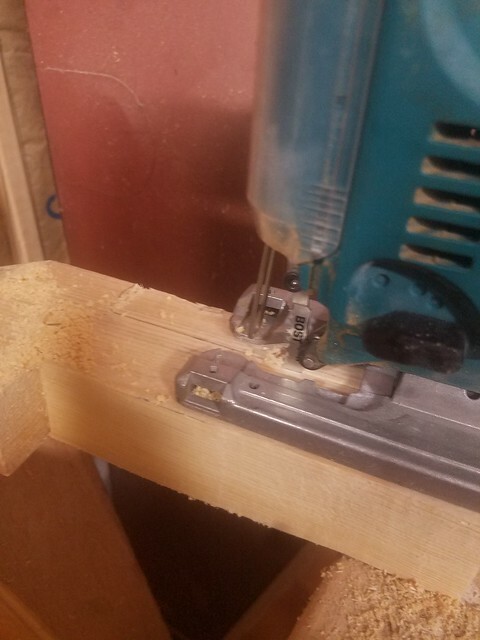 If the newer spline was too large it wouldn’t fit in the groove, if it was too small, it wouldn’t stay in place. Thankfully, it was close enough to work well. After all of the spline was removed and I cleaned the door, I was ready to start putting the new screen in place. 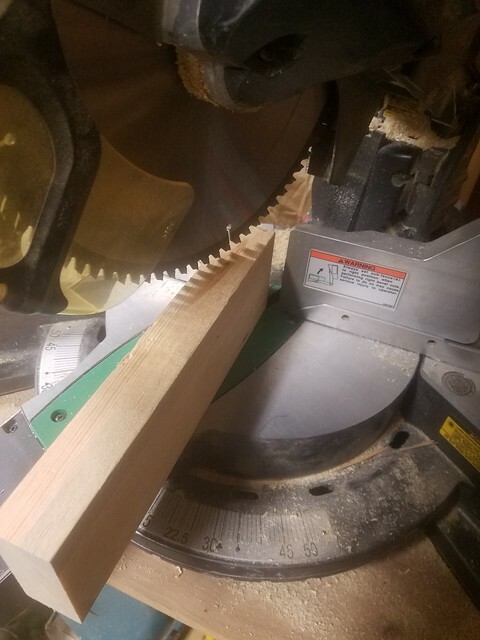 I carefully centered the screen over the opening and laid the spline over the groove. Working with just one side I used the spline tool, which is basically a handle and a roller, and pushed the spline down into the groove. It was a tight fit, but not too tight, just enough that I knew that it wasn’t coming out. I worked my way around all four sides pulling slightly on the screen to keep it taut. At the corners I had to use the pick again to squish the spline down tight where the spline tool couldn’t reach. 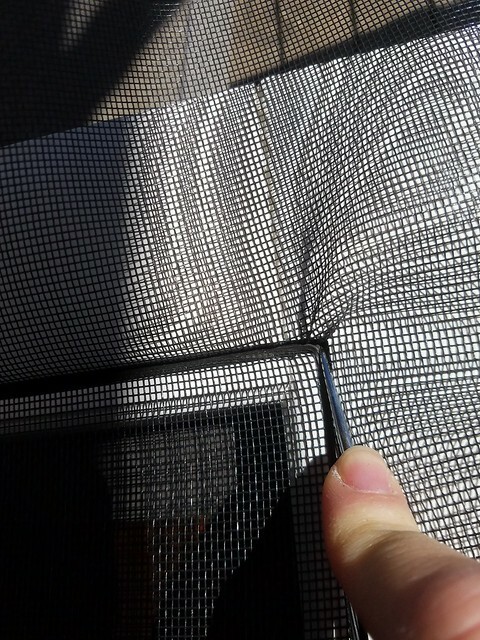 Once I felt that the screen was in securely and pulled tight, I trimmed the excess screen off with a razor blade. In the case of our door, there were two separate screen areas so I repeated everything on the second half of the door. I was then ready to rehang the door. 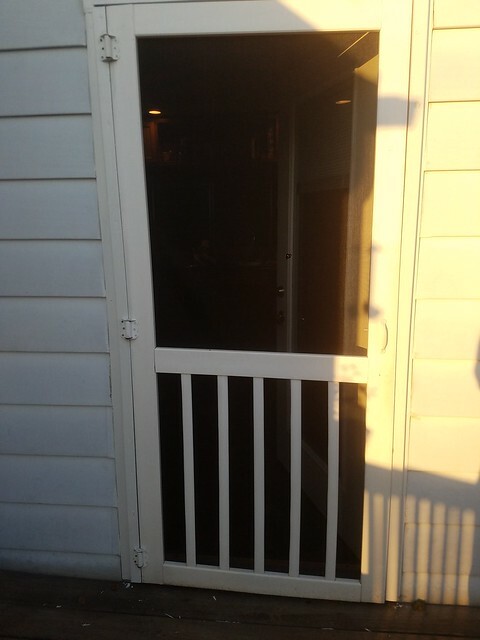 I was nervous tackling this project because I was worried that it would never look like it did when the door was new. But honestly, this was such an easy project and cost me less than $10 for the kit. Now we’re ready for this guy’s next adventure. Well done, Sarah. It looks really professional. 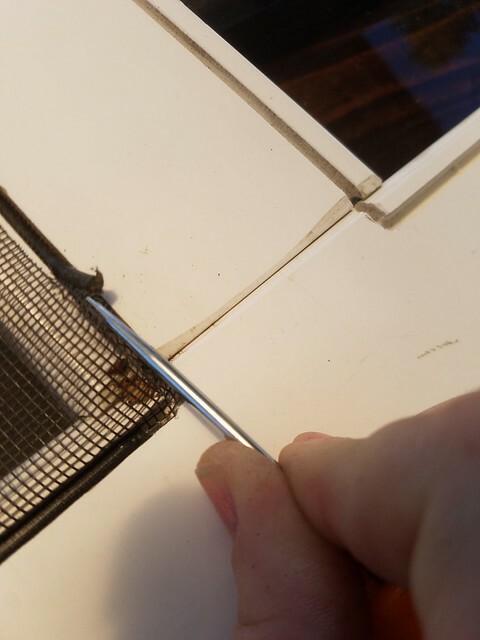 We love having the windows open in the summer, but I’m realizing a few of our screens are in need of repairs. We’ve found ourselves chasing moths or even the occasional mosquito in the house. In the past, I’ve patched a hole. Rescreening sounds pretty easy and straightforward. 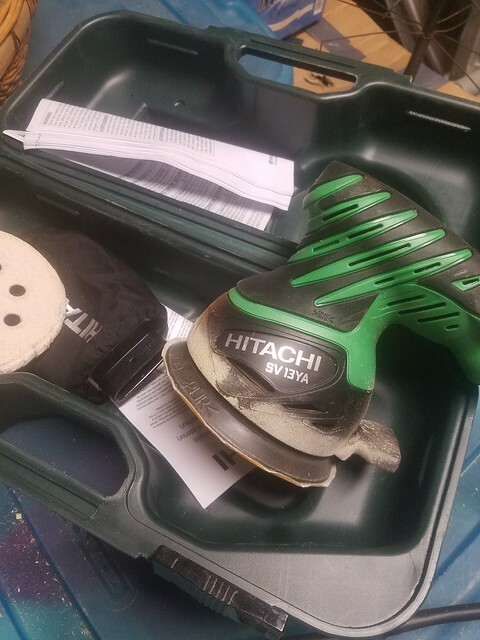 Plus I’m ensured of not missing any holes. 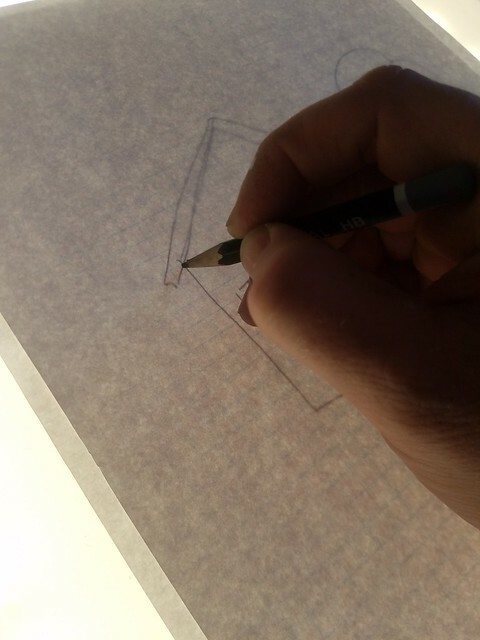 Hand up if you’ve ever found yourself standing at a window, trying to hold two pieces of paper steady while you traced a pattern. My hand’s definitely up. It’s awkward, right? For crafters, tracing is an important part of a lot of projects. 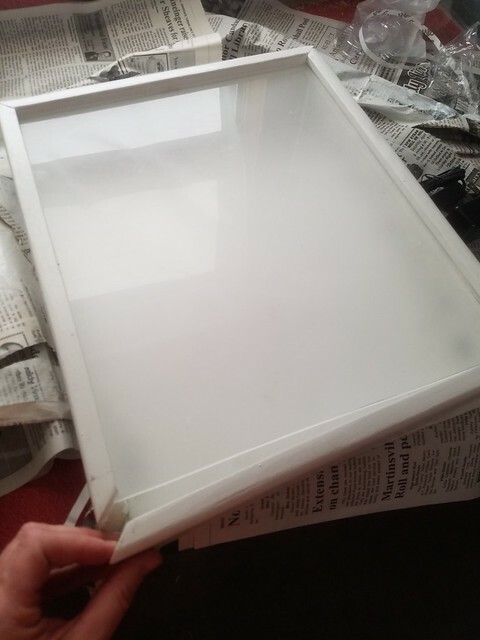 A light box is a handy tool that makes tracing much, much easier. 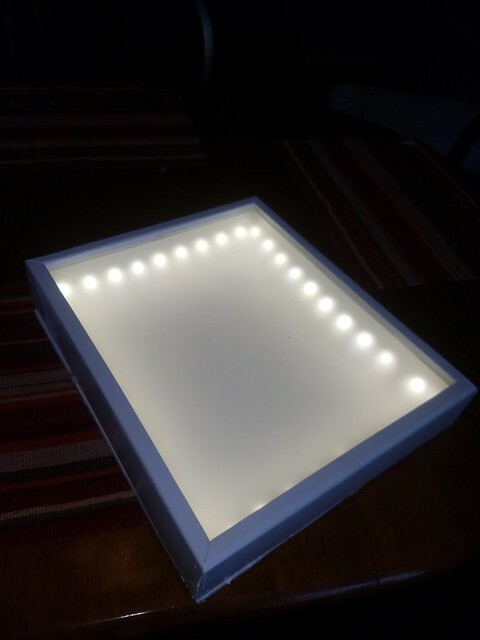 Sarah in Illinois is sharing how she made a light box for her quilting mother. Starting from the bottom, the garden is doing well. Very well. Plants are growing, we’ve picked some veggies, had some setbacks, but overall it’s doing very well. I decided to write a separate post on the garden, so I will just say I am very happy with the progress so far. The grill lighting is on hold. When we hung the decorative string lights on our awning this year we decided that they give off enough light to make sure our hamburgers aren’t burnt. And since we are not sure what we want in permanent lighting we decided to do more research before we make the money and time commitment. So not done, but on hold. As for the light box, I can say it is done. 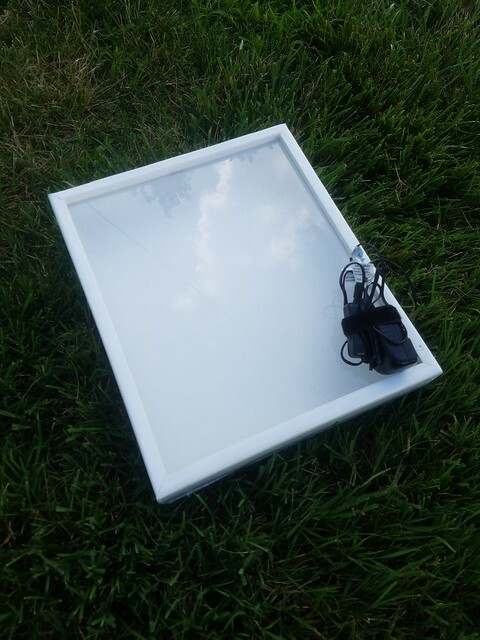 So what is a light box? Basically, it is box with a transparent top and a light source inside. When you put a print and a blank piece of paper on top of the box, the light shines through and makes it easy to trace the original print. This is great for crafters wanting to copy patterns. In this case, my mom wanted one for making quilts. 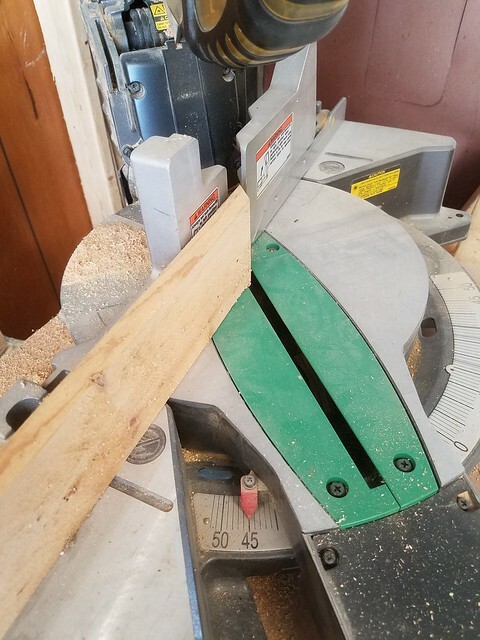 I started by cutting 45 degree angles for the 4 sides of the box. Then I got to play around with the router. Honestly, I had not used our router before. It is kind of Steve’s toy, but using some practice boards it was fairly easy to get the hang of. 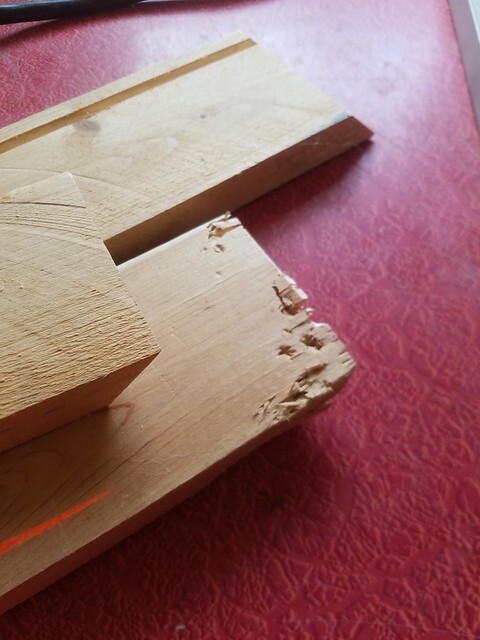 The reason for the router was to cut a groove in the sides of the box for the transparent top to sit in. 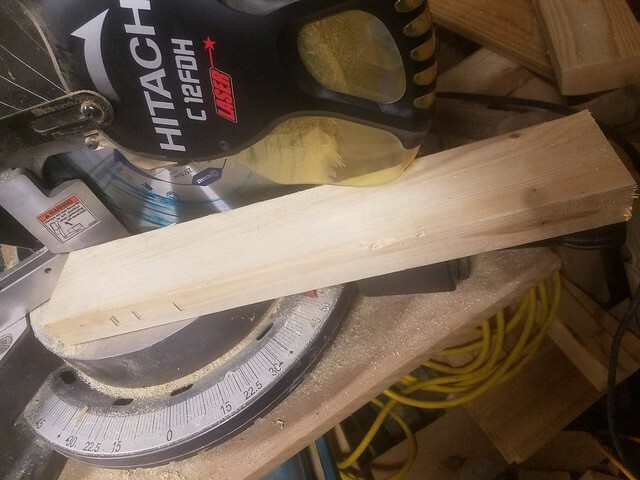 I also used the router to curve the edges of the boards to give it a nicer look. So this was the point where I would have started assembling the pieces. Except I came home and found that Blitz had put his mark on two of the pieces, quite literally. It aggravated me of course, but who could I blame but the person who left them where a 10 month old pup could reach them? In case that wasn’t clear, that person is me. So after redoing half of my work I began putting the sides together. Simply put, it is like building a frame for a picture. 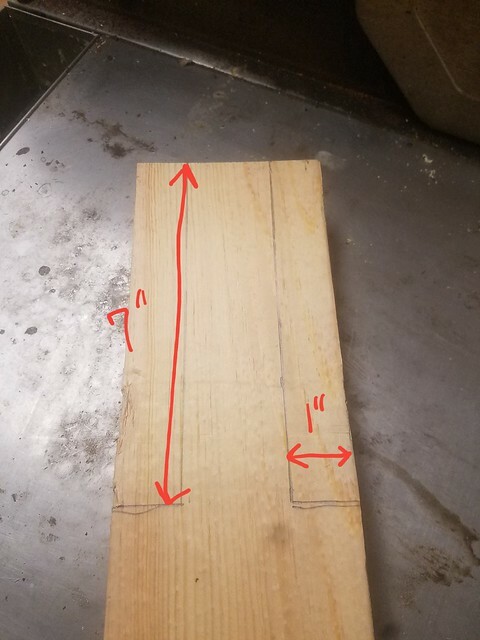 The finished dimensions are 13 inches by 15.25 inches with the “window” area being 12.5 inches by almost 14.75 inches. Obviously I didn’t work by any plans, I just wanted to make sure it was large enough to use a standard 8.5 by 11 piece of paper for tracing. 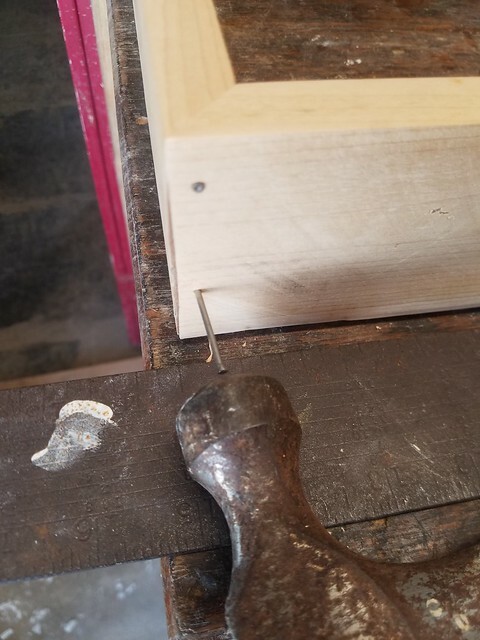 I pre-drilled my nail holes and put three sides together. It was at this point that I put the first coat of white paint on all of the pieces. It has been extremely humid here which is not the best weather for paint to dry. I got several scratches and finger prints on the pieces that had to be touched up once I was done handling everything. 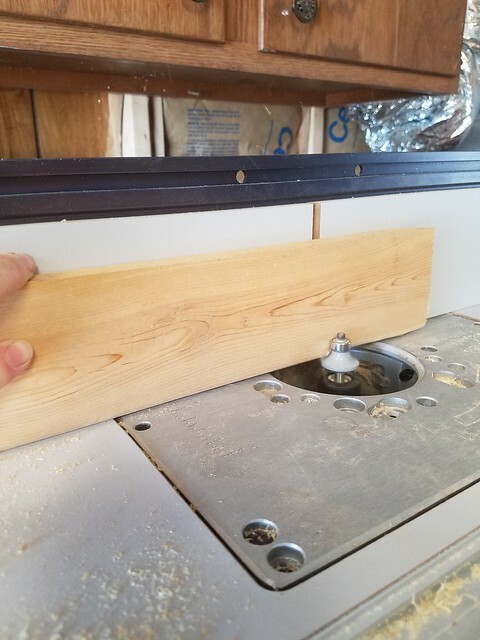 I slid the “window” into the channels that I routed and attached the fourth side. For the window I used a piece of plexiglass that I cut with a razor blade and snapped to break. To hide the inside of the box and to dull the brightness of the intense lights that I chose, I sprayed the plexiglass with a frosted paint. It was at this point that I turned the box over and installed the light source. 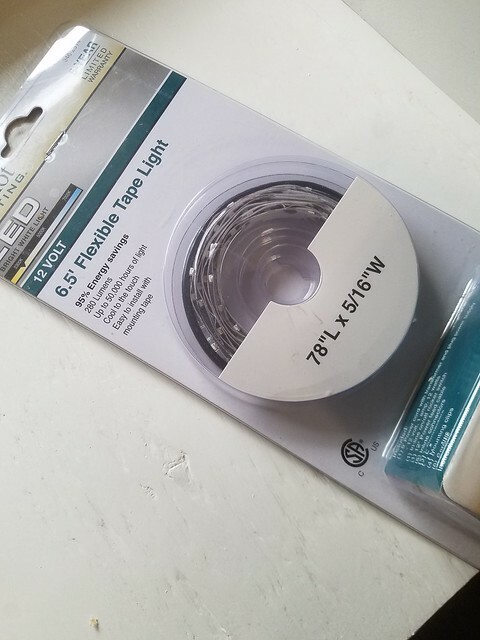 I chose this LED tape at our local home improvement store. 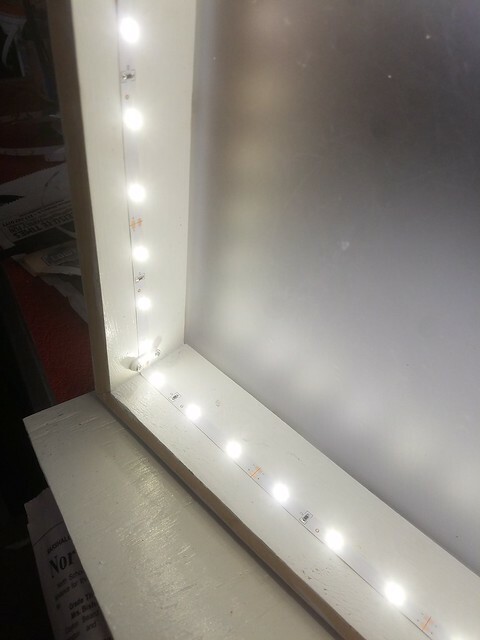 I wanted LED so that heat did not build up inside the box. This tape is 6.5 feet long but came with instructions on how to cut it to the correct fit. I used both the adhesive back and the small mounting brackets that came with the tape. 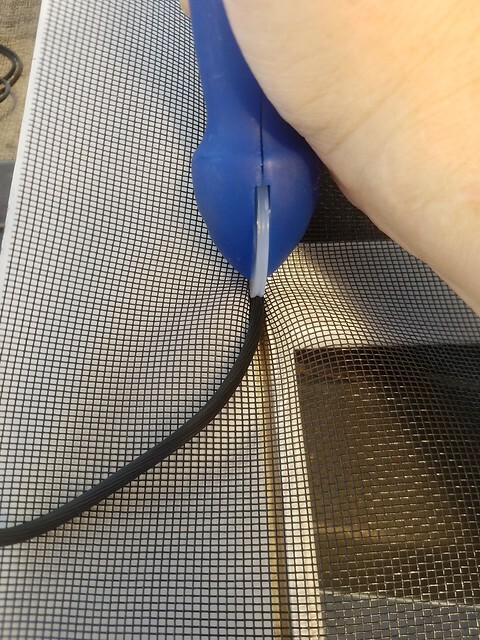 I cut a small hole near the bottom to run the cord out of. 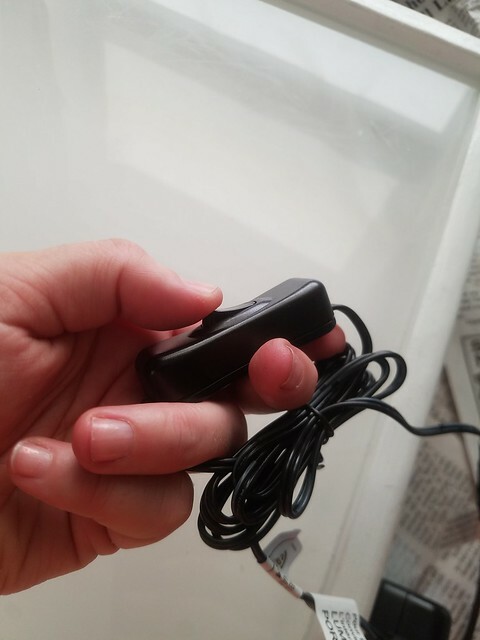 I was pleasantly surprised that the light tape came with a switch so that it will be easy for Mom to turn on and off as needed. And finally I screwed the back to the box. I chose to use screws so that I can remove the back if I ever need to make any adjustments or repairs. 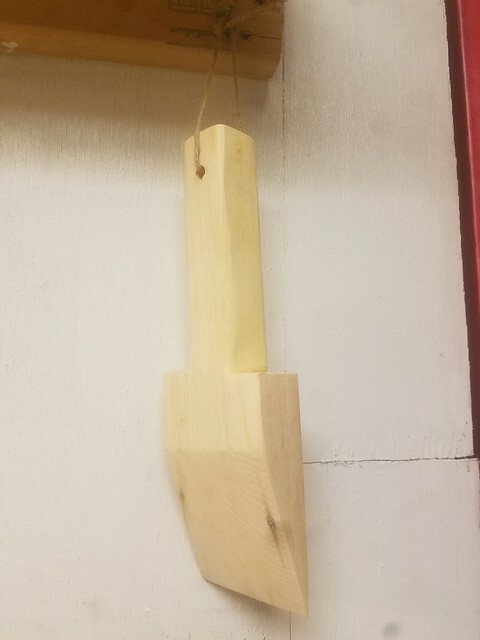 I am happy with the results and can’t wait to give it to Mom for her to try out.